Took awhile to find it, but here it is: the best CCG card ever made. C.A. Radford. Chaos Personified. 2 Cost. 3 Attack. 3 Defense. Sub-Random gear on Radford may not be popped. 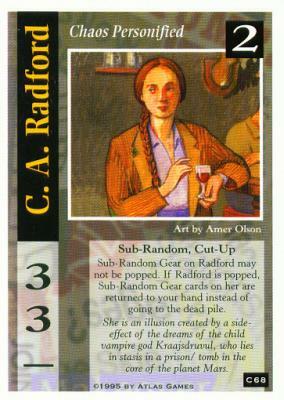 If Radford is popped, Sub-random gear cards on her are returned to your hand instead of going to the dead pile. She is an illusion created by a side-effect of the dreams of the child vampire god Krassjsduvul, who lies in status in a prison /tomb in the core of the planet Mars.